with capacity to run up to 200 zones provide a highly versatile irrigation system for the property owner. Additional valves or zones are simple to add after installation because the two wire path can be spliced into anywhere along its path thus greatly simplifying this process. Due to the ease of adding zones and enhanced system intelligence, watering pots/planters, hanging baskets, multiple lawn areas and planting beds all with varied and unique watering needs becomes easier than ever before for the property owner. Your team at Hermes Landscaping will be happy to help you with choosing the right 2-wire sprinkler system for your building. Because the decoder systems use just a two wire path that sends both data and power to the remote control valves it is often easier and less costly to install larger (30 zones+) irrigation systems compared to conventional systems and the break even price to step up to these advanced systems is continually dropping over time. The bells and whistles like monitoring and running these systems remotely from a smart phone that can be added to these advanced two wire irrigation systems are mind boggling. Maintaining continuity of the two wire path is far simpler than with conventional irrigation controllers with bundles of control wires running everywhere which means damaged wires can be found and repaired quickly keeping these robust irrigation systems up and running a higher percentage of the time than conventional irrigation controlled systems. The typical two wire irrigation controller linked to a flow sensor has a level of intelligence that prevents the owner from scheduling too many valves to come on at one time and allows up to 5 zones to run at a time, which is music to the ears of large property owners and sports field managers. 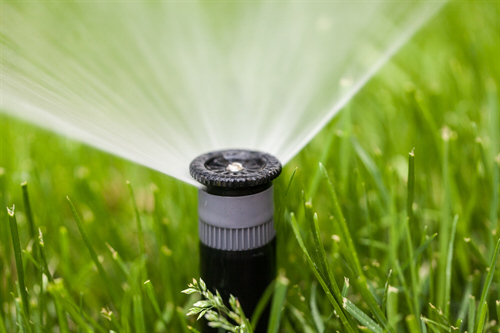 Hermes Landscaping can help you review your options in regard to 2-wire sprinkler systems. We invite you to contact us for more information about the systems we recommend.